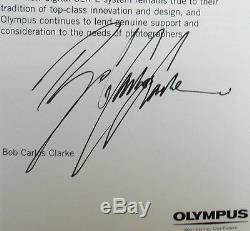 SIGNED by Bob Carlos Clarke on page three. This rare and collectible Carlos Clarke publication was made specifically for the London opening of the Bob Carlos Clarke Love Dolls Never Die exhibition in November 2004. 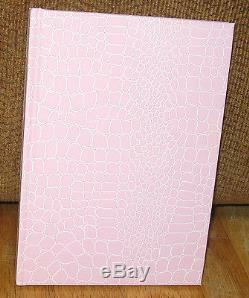 Bound in a vibrant pink vinyl with a faux crocodile finish, the edition was limited to just 300 copies. The book is a tongue-in-cheek view of the current volatile relationship between the sexes with glossy photographs and a witty text by Bob Carlos Clarke. This isn't for men who still believe they can control women, it is for the rest of us, who know the game is up. Internally clean bright and tight. Hint of tanning to page edges. The item "SIGNED Bob Carlos Clarke Love Dolls Never Die Limited ED 300 HC Women" is in sale since Wednesday, August 22, 2012. This item is in the category "Books\Antiquarian & Collectible". The seller is "hmxa15a" and is located in Island Park, New York. This item can be shipped worldwide.